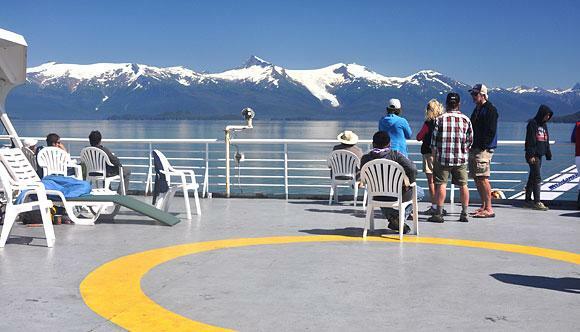 Ferry travel to and within Alaska is by The Alaska Marine Highway System (AMHS) provides year-round transport to over 30 Alaska communities from southern gateway cities of Bellingham, Washington and Prince Rupert, British Columbia to ports across Alaska. Many Alaska communities are not accessible by road systems, making the sea travel option, essential. This waterway route is so special it has been designated a National Scenic Byway and All-American Road; it is the only marine route with this designation. This waterway route covers more than 3,500 miles through Southeast Alaska, across the Gulf of Alaska, to Prince William Sound, the Kenai Peninsula, Kodiak Island, and the Aleutian Chain (see maps). The ferry system connects with highways in Bellingham, WA and Prince Rupert, BC as well as the Alaska communities of Haines, Skagway, Valdez, Whittier and Homer. Motorists often combine a ferry trip with their driving itinerary, which can save you hundreds of miles of driving, depending on your itinerary. The state ferry fleet provides passenger/vehicle ferry service in 3 regions: Southeast, Southcentral/Prince William Sound and Southcentral/Southwest. There is also Cross-Gulf service in summer connecting Juneau in Southeast and Whittier in Southcentral. The Alaska state ferry system has 2 seasons: May–Sept. (summer), when sailings are most frequent; and Oct.–April 30 (fall/winter/spring), when service is less often. For trip planning and scheduling, please go to the DOT website. Email questions to the Alaska Marine Highway System or phone the central reservations office in Juneau at 1-800-642-0066. Reservations: The Alaska state ferries are very popular in the summer. Walk-on traffic is usually accommodated, but reservations are strongly recommended, especially for those traveling with a vehicle or wanting a cabin. You can make reservations online or by calling toll-free 1-800-642-0066. Or use a reservation agent. Reservations for cabin space and for vehicles should be made as far in advance as possible to get the sailing dates you prefer. However, don’t assume a sailing is sold out, if you decide on the spur of the moment to include the ferry in your itinerary, phone or check online to see if there is space available. Vehicles: Vehicle fares depend on the size of your vehicle and the distance you travel. You are charged by how much space you take up, so a truck with trailer is measured from the front of the bumper to the end of the trailer, including hitch space. Charges are also applied to motorcycles, bikes and kayaks. Do not attempt to estimate your vehicle length; you must accurately measure your vehicle to avoid additional charges and the potential for being moved to a later sailing due to size restrictions. Maximum length allowed is 60 feet, although some restrictions apply to certain ports and vessels. Please call 1-800-642-0066 for more information. U.S. Coast Guard regulations prohibit access to the car deck while the ship is underway; therefore, passengers are not allowed to sleep or dine in their vehicles. Cabins: If you are traveling on one of the longer ferry runs, such as the 38-hour trip between Bellingham, WA and Ketchikan, AK, you should reserve a cabin well in advance. Cabin fares are charged per unit, not by the number of people using the cabin. In other words, the cost of the cabin is the same whether one or more passengers occupy it. Cabins are outfitted with single or double bunk bed-style berths and vary in size and availability. Some cabins have a toilet, shower and linens (towel, sheets, blankets). Pick up keys from the purser’s office when you board. You can also rent blankets, pillows, and towels for a fee from the Purser. Other Sleeping Accommodations: If cabin space is sold out or you wish to save a few dollars and travel without a cabin, the inside recliner lounges and the covered solarium located on the upper deck serve as sleeping areas. Just bring your own sleeping bag and find yourself the perfect spot to relax for the evening. Small, free-standing tents are also permitted on the solarium deck (but not under the heated covered area) and on the stern of the cabin deck. Be sure to bring duct tape to secure your tent to the deck as strong winds can pick up while the ferry is underway. Food & Beverage Service: Food service varies from vessel to vessel. Hot meals, snacks, and beverages (including beer and wine) are available in cafeterias, or snack bars on all vessels, except the Lituya. The Columbia and Tustumena also have full-service dining rooms. Food service hours vary based on sailing departure times. Alcoholic beverages may be consumed only in cabins or cafeteria by persons 21 years of age or older, and may not be consumed in public areas of the ship. You can bring your own food and beverages, but keep in mind that refrigeration is not available on board; however, microwaves, coin-op ice, soft drink, and candy machines are available on mainline vessels. Luggage: You are responsible for your own luggage. Foot passengers may bring up to 100 lbs. of hand luggage. There is no limit on luggage carried in a vehicle. Baggage carts for carry-on luggage are driven between the terminals and the car deck. Baggage handling is NOT provided and the Alaska Marine Highway System is not responsible for lost, stolen, or damaged luggage. Pets: For a pet to be transported via ferry between Bellingham, WA and Prince Rupert, BC and Alaska ports, they must have a valid rabies certificate and a health certificate, issued within the past 30 days. Both must clearly identify your animal and be presented at check-in. A certificate of health is not required for travel between Alaska ports. Dogs and other pets are not allowed in cabins and must be transported on the vehicle deck only, the exception being animals aiding disabled passengers when prior approval has been obtained. Pets are to be transported inside a vehicle or in suitable containers furnished by the passenger. Pets must be cared for by the owner. On long sailings, you may feed, water and/or walk your pet on the car deck during one of the 15-minute announced car deck calls. You may also walk your pet at port stops. Keep in mind that some port stops are very brief and that sailing time between some ports will be as long as 38 hours (Bellingham to Ketchikan). Car deck calls are dependent on weather conditions and other variables. Accessibility: Cabins are equipped to accommodate passengers with disabilities. They have elevator access to cabin decks. Hazardous Materials: Hazardous materials may not be transported on the ferries. The valves on propane or similar type tanks must be turned off and sealed by an AMHS employee. Portable containers of fuel are permitted but must be stored with vessel personnel while en route. ID Requirements: All AMHS customers are required to show proper Valid Government ID, meaning photo identification issued by a government authority such as a state or provincial driver’s license, passport, official government issued ID, or military ID. Passengers traveling in or out of Prince Rupert, BC, or who plan on driving through Canada, are required to show their passport. Passengers onboard AMHS vessels between Bellingham, WA and Ketchikan, AK are not required to show a passport as the ship does not stop in a Canadian port along the way.